When you think of arthritis, you most likely picture an elderly person with achy fingers or knee pain about which they constantly complain. And it’s true that arthritis rates are high among senior citizens, with nearly 50 percent of those 65 and older suffering from this condition according to the Centers for Disease Control and Prevention. But new research suggests that you don’t have to be eligible for AARP to experience arthritis pain, in fact, it may be surprisingly common among people decades younger. The study, which took place at Boston University in Massachusetts, found that approximately 91 million adults in the United States may have arthritis, and almost one-third of them are between the ages of 18 and 64.1 These results were based on information compiled on 33,672 men and women who participated in the 2015 U.S. National Health Interview Survey. The figures generated by this research are 68 percent higher than earlier estimates of arthritis rates. But rather than necessarily uncovering an upsurge in the condition, it is likely due to widening the scope of who might be considered arthritis sufferers. Previous calculations were based solely on individuals who had received a diagnosis of arthritis from a physician. For this investigation, however, the researchers also included everyone who reported experiencing joint pain and other symptoms of arthritis that lasted for a minimum of three months. While it is not as comprehensive as a full examination that includes visual identification of swelling, taking a family history, and performing tests that offer information on the problematic joints, symptomology is nevertheless one of the most important elements in determining a diagnosis of arthritis. The data showed that, in subjects between the ages of 18 and 64, 19.3 percent of men and 16.7 percent of women had chronic joint pain but no diagnosis of arthritis, which is not surprising since many doctors do not look for arthritis in younger patients. And that’s also why those percentages are actually lower among the older study participants. Among those 65 or older, nearly 16 percent of men and just under 14 percent of women reported suffering from joint pain without an official arthritis diagnosis. The rate of arthritis symptomology was 29.9 percent in men under 65 and 31.2 percent in women under 65. Of course, this jumped sharply with age. The prevalence in men 65 and older was 55.8 percent, and 68.7 percent among their female peers. Osteoarthritis is a “wear-and-tear” disease of the joints in which cartilage begins to wear away over time. The result is painful friction of the bones within the joint, inflammation, and stiffness. The most common joints to become arthritic include the neck, lower back, hips, fingers, and knees, which is hardly shocking since these are all practically in constant use. In fact, arthritis is often found in athletes’ hips and knees because many sports can place more stress on the joints than what is normally encountered, as well as the fact that athletes are more likely to have joint injuries. But clearly rates of arthritis as high as what was shown in the current research are not all attributable to dedicated exercise routines. In fact, one of the greatest risk factors for arthritis is being overweight. It makes sense since your joints have to work considerably harder to move around 20-30 pounds or more of excess weight. A 2005 study at Wake Forest University in Winston-Salem, North Carolina showed that losing just one pound of weight removed four pounds of pressure from the knee joints.2 And shedding extra pounds also helps reduce inflammation, which is one of the hallmarks of arthritis. So, whether you are trying to avoid developing arthritis or you’ve already got the diagnosis, getting down to a normal weight will benefit your body. You can eliminate years of living with pain every time you walk across a room or need to go downstairs. And you can prevent being told by your doctor to take NSAIDS regularly or that you need to undergo joint replacement surgery. 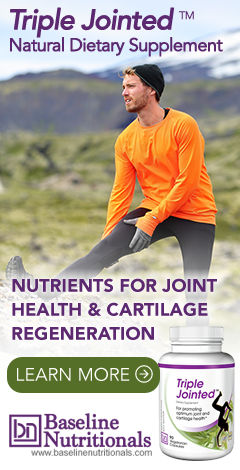 Take care of your joints now for a much more comfortable future. 1. Jafarzadeh, S. Reza and Felson, David T. "Updated estimates suggest a much higher prevalence of arthritis in US adults than previous ones." Arthritis & Rheumatology. 27 November 2017. Accessed 6 December 2017. http://onlinelibrary.wiley.com/doi/10.1002/art.40355/full. 2. Messier, SP; et al. "Weight loss reduced knee-joint loads in overweight and obese older adults with knee osteoarthritis." Arthritis and Rheumatism. July 2005. Accessed 7 December 2017. https://www.ncbi.nlm.nih.gov/pubmed/15986358. Well, yes, good info as far as it goes for people who are overweight, but you provide no useful info for people of normal weight who have arthritis. For instance, I have been normal weight my entire life, active but not a pro athlete, but I have mild scoliosis that has contributed greatly to my developing osteoarthritis in my right hip. My physical therapist tells me that the scoliosis hasn't done my hips any favors. How about an arthritis article that discusses causes of arthritis other than excess weight? All you have to do is search on our site for more articles! These are short health news blogs, not full reports. You are probably looking for this: https://jonbarron.org/anti-aging/five-pronged-approach-chronic-joint-pain-and-inflammation. It not, just search on top--we have lots of articles that cover osteoarthritis.